The confetti has settled and echoes of Jason Kelce’s famed parade speech have (unfortunately) faded, essentially putting an end to the Philadelphia Eagles’ Super Bowl LII celebrations and marking the beginning of the team’s journey towards a repeat outcome in 2018. First on Philadelphia’s list of offseason moves will be maintaining a Super Bowl-caliber roster through free agency, which will entail re-signing notable in-house talent and replacing those who sign elsewhere on a budget that couldn’t be tighter. Eagles’ Howie Roseman is currently in the red in terms of salary cap space at -$9,66,190, which will undoubtedly force him to lean on budget deals and roster cuts this offseason. Of course, the Eagles’ nucleus of talent will remain intact, but the team’s depth and some of the supporting cast is expected to either become cap casualties or depart for greener pastures. A key member of said nucleus, Bradham trailed only defensive backs Malcolm Jenkins and Jalen Mills in total defensive snaps as a key contributor and field general in 2017, especially following Jordan Hicks’ season-ending Achilles injury in Week 7. The seven-year veteran earned an 80.6 overall grade across his work-intensive season, marking the second consecutive season with an 80.0-plus overall grade. He most notably excelled in coverage, earning the sixth-ranked coverage grade (86.5) among qualifying linebackers and allowing just 0.60 yards per coverage snap. Though Hicks will return in 2018, defensive coordinator Jim Schwartz will still need a talented linebacker to play outside in his 4-3 base defense, a role Bradham proved more than capable of in 2016. Also, having played more of an inside role in Hicks’ absence in 2017, Bradham’s positional versatility will be missed if he does leave the Eagles’ already thin linebacker group. Roseman’s shallow pockets will keep him from making any signing of the ‘splash’ variety in free agency, but he still can add worthwhile value with his limited budget if he chooses to target Solder. Entering his eighth year in the NFL, Solder is approaching the tail end of his career, as he will take the field at 30 years old in 2018. However, his strong, consistent play over the years as Tom Brady’s blindside protector paired with his admirable size (6-foot-8, 320-pounds) and strength should have teams interested this offseason. He has earned a 74.0-plus overall grade in six of his seven years in the league and has quietly become one of top run-blocking tackles, most recently earning an 83.2 run-block grade in 2017, which ranked T-No. 12 among offensive tackles. After tearing his MCL and ACL in 2017, the 36-year-old Jason Peters’ future in Philadelphia is in question, as the $10.6 million he’s due next season could force Roseman’s hand in either releasing or trading him prior to the 2018 season. Also, even if Peters does return on a restricted deal, a combination of his health and age diminishes his reliability and, in turn, will push the Eagles to add quality depth at the tackle position. Like Solder, the Raiders’ Bowman is still capable of playing at a high level despite being a bit long in the tooth (29 years old). His 84.8 overall grade in 2017 ranked 11th among qualifying linebackers, and he ranked tied at No. 7 in total run stops (33) en route to a 17th-ranked 85.4 run-defense grade. Re-signing Bradham will keep the Eagles out of the Bowman sweepstakes, but if Philly’s brass can’t agree to a contract extension with Bradham, Bowman may have to be their Plan B.
Reid, a former first-round pick out of LSU in 2013, may have fallen short of the game-changer label he was projected to earn after being drafted so high, but he has performed well with notable consistency. He has earned a 72.0 overall grade in four of his five years in the league, and he’s done so as a versatile chess piece in the 49ers’ defense, playing significant snaps at linebacker, safety and in the slot. 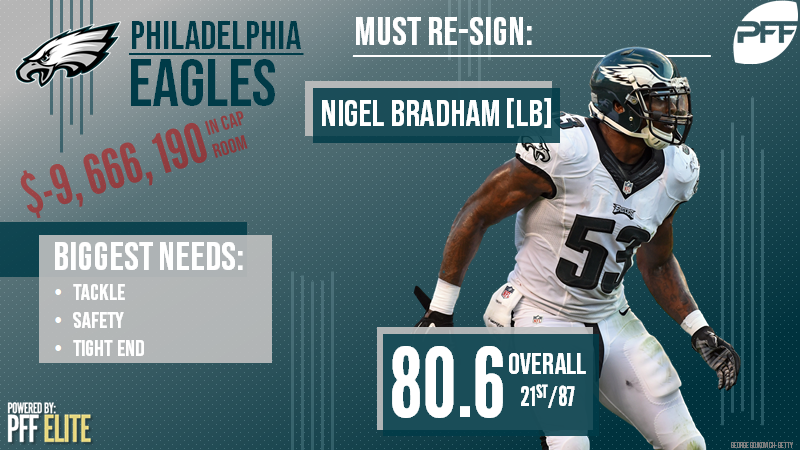 Reid’s versatility fits the Eagles’ needs in the secondary, especially if Corey Graham and Patrick Robinson depart via free agency.